We retain the high relative weightings to equities given economic health and expectations for continued GDP growth. However, our style guidance has shifted to 50/50 growth/value. We eliminate exposures to equities outside the U.S. due to our expectations for a slowdown in global growth and difficulties in particular domiciles, notably continental Europe and the U.K. Despite sentiment indicators ticking down slightly over the past month, the U.S. economy continues to expand. A continuation of this expansion through March will lead it to become the longest on record. Though one often hears that the U.S. economy is in the latter innings of its growth cycle, which stretches back to June 2009, we believe the economy will grow into extra innings. The growth trajectory, however, should become more muted, with our forecast at 2.7% GDP growth for 2019. Underpinning our forecast is not simply sentiment and growth, but our belief that the Fed will suspend its vector of raising the fed funds rate as well as its aggressive reduction of its balance sheet. 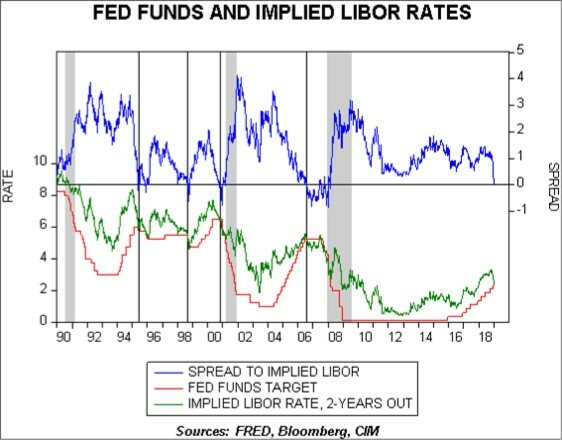 Regarding the former, as the accompanying chart displays, the spread between two-year forward LIBOR and the fed funds target rate tightened dramatically over the past month. This chart illustrates the reason that recent rhetoric from members of the FOMC has been markedly dovish. Relative to the balance sheet, since October the Fed has been shrinking its holdings by $50 billion each month, or at an annual rate of $600 billion. While we think they will allow the $385 billion maturing in 2019 and the $284 billion in 2020 to roll off, we don’t anticipate outright sales of securities from their portfolio. In addition, we expect they will reinvest prepayments on their agency mortgage-backed securities holdings back into the long end of their portfolio, principally in agency mortgage-backed securities. The potential for a hiatus on tightening by the Fed could conceivably be extended through the 2020 election season. Worldwide, we are forecasting reduced global growth, especially in light of expected tightening by the European Central Bank and the Bank of Japan toward the back half of the year, as well as a slowing of growth rates from China and economic challenges facing Britain and continental Europe. Although we expect weakness in the U.S. dollar relative to other major currencies, which would be beneficial for U.S.-based investors, the challenges and diminished growth offset near-term advantages of exposure to non-U.S. equities. While the growth in profitability for U.S. corporations will slow relative to last year’s torrid pace stemming from corporate tax reform, growth will nevertheless be positive. Confluence’s estimate for S&P earnings in 2019 is $160.93, representing a 4.2% increase over our estimate for the full year of 2018. The most significant influence will be market sentiment as reflected in the price to earnings [P/E] ratio. The equity market correction in the fourth quarter of 2018 caused the trailing P/E on the S&P 500 to decline to 17.2x by the end of the year. Our base case, given the Fed’s posture and the prospect for market sentiment to improve, is a rebound to a P/E of 18.6x. The spike in retail money market balances to over $1.15 trillion provides further buying potential for equities among retail investors, buoying our favorable outlook. Regarding style and sectors, our former tilt to growth that existed for nearly two years has been brought back to an equal split between growth and value. This is due principally to our more muted forecast for GDP growth and complemented by the relatively extreme valuation differentials between growth and value equities. As an example, based upon year-end 2018 prices, the P/E for the S&P 500 Value Index stood at 13.5x as compared to the 22.3x for the S&P 500 Growth Index. Similarly, the price-to-book [P/B] ratio was 2.0x for value versus 4.6x for growth. While the sizable valuation differential can persist for an extended period, especially as markets advance, we find it prudent to eliminate the overweight to growth. Among sectors, we retain the prior overweights to Energy and Materials, while the former overweight to Financials is replaced by an overweight to Healthcare. Among capitalizations, our bias is an overweight to both mid-caps and small caps due to more attractive traditional fundamental valuation measures of P/E and P/B. Moreover, the IRS’s finalization of rules announced on 12/18/2018 regarding repatriation of foreign earnings of foreign subsidiaries of U.S. companies should prove beneficial for prices of companies classified as mid-cap and small cap as well as in the lower strata of large cap, by virtue of increased M&A activity. Accordingly, all of our asset allocation portfolios have historically high levels of equity exposure and in the portfolios where it is risk appropriate we include express overweights to mid-cap and small cap equities. In contrast to our sanguine view of U.S. equities, we find that the risks outweigh the potential for non-U.S. equities. Though comparative valuations are attractive, the expectations for a slowdown in global growth combined with complications stemming from the EU and Britain lead us to a cautious near-term stance. Brexit, Italy’s budget plans, a new head of the ECB, a new German Chancellor and elections in the European Parliament conspire to make us cautious on overseas exposure. While a weaker U.S. dollar would be a tailwind for U.S.-based investors, we are more comfortable avoiding non-U.S. equities for at least the first portion of the year. The earnings estimates are based on Standard & Poor’s methodology for determining S&P earnings, which differs from Thompson/Reuters I/B/E/S by 7%. Our premise for the Fed’s suspension of tightening for a period of time, perhaps stretching through the 2020 election cycle, naturally leads to the expectation that short rates will be anchored. What is murky is the continuation of the global appetite for yield, the initiation and pace of tightening by the ECB and BOJ and their potential effects on U.S. rates, and the domestic inflation outlook, especially with a more dovish Fed. Adding to this murkiness is the effect upon corporate spreads of $3 trillion of corporate debt maturing before 2022, coupled with the change in interest expense deductibility in 2022 from 30% of EBITDA to 30% EBIT. Given the uncertainties for the intermediate and long segments of the Treasury and corporate curves, we retain the laddered bond positioning we introduced a year ago. In addition, exposure to speculative grade bonds remains at historically low levels in the portfolios despite the sizable widening of spreads over the last quarter. Although speculative bonds are more attractively valued than they were three months ago, we are cautious about embedded risk. We maintain the allocation to REITs in the more income-oriented portfolio due to attractive and improving dividend yields and the diversified income stream they afford. Relative to speculative bonds, we find the potential risk/reward to be superior in REITs. We also retain the modest allocation to gold owing to the combination of its ability to offer a hedge against geopolitical risk and the safe haven it can afford during an uncertain climate for the U.S. dollar.